The “Strike of the mind” is one of the main issues in the novel. Rand’s belief that great minds are the engines of social progress is contained in this theme. It is the work of great minds which create and fuel progress and not labor. The idea that society is driven by working people is contrary to Rand’s philosophy. The novel claims that by devaluing the work of great minds in the service of collectivism drains society of its best resources and opens things up for looters to drive society to ruin. Rand believed that collectivism forces people to put the interests of others over their own rational self-interest. The novel attempts to demonstrate that when a society places all value on collective needs, the balance of progress collapses into chaos and evil. The episode of the Twentieth Century Motor company portrays a situation in which the company decides to pay workers according to their needs and their abilities. As a result, the workers become depraved and immoral, and the company falls into ruin. Rand believed that individual sacrifice for the good of the group leads to chaos. Another important feature of the philosophy of Ayn Rand is the idea that the mind and the body are not split. For much of accepted philosophy, the mind and body are essentially a duality. 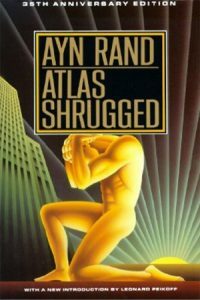 Rand disagrees and the novel demonstrates the unity of the mind and body. Dagny is a great mind and a highly effective business person. She also proudly and defiantly taps into her sexuality. For Rand, this latter would have been an expression of her success. That she is firmly an expression of her body as well as her mind is exactly why she is a heroic character in the novel.